Today, radiology departments are wrestling with optimizing operations to ensure the appropriate use of imaging equipment, reduce costs, manage reimbursements, and improve patient outcomes. More than 1 billion imaging exams are performed each year in the United States, costing more than $100 billion annually. 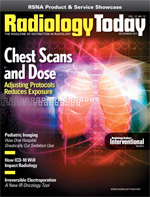 Given the volume of imaging and the amount of expenditures, healthcare organizations have little choice but to make the radiology department as efficient as possible in terms of patient care and radiologist workflow. That focus translates into added pressure to deliver timely documented reports while also being nimble enough to support workflow among multiple sites, RIS, and PACS. At Mount Sinai Medical Center in New York, we’ve taken a systematic look at our own radiology workflow and sought opportunities to improve the process. Carefully selecting new technologies with attention to process improvement has resulted in measurable enhancements. Mount Sinai Medical Center is a 1,171-bed, tertiary care teaching facility that handles nearly 60,000 inpatients and 530,000 outpatient visits per year. Our average turnaround time (TAT) for radiology reports was upward of 72 hours, which stalled communication to referring physicians and patients. In addition, we were spending hundreds of thousands of dollars on transcription support for these reports. Since the late 1990s, we have constantly assessed new and evolving technologies, looking to judiciously introduce solutions that will improve our workflow, diminish operational costs, and improve the delivery and quality of our imaging services. For most radiology departments and imaging centers, PACS implementation had a tremendous impact on services, enabling radiologists to increase the volume of exams they interpret despite those exams’ increasing complexity. Still, there were gaps in workflow improvement. One obvious area in need of workflow enhancement is the reporting process. For example, while emergency physicians benefit from the improved image access in the PACS era, they often have not benefited from improved availability of the radiologist’s interpretation and report. At the 2006 RSNA annual meeting, my department chair walked around the exhibit hall and noticed how many speech recognition solutions were available. This observation came five years following our research on the viability of this technology as a means to dictate radiology interpretations and communicate results. In 2001, we had determined the technology was simply not up to par. With time, product maturation, and new innovation, we decided it was again time to explore this avenue as a potential means to improve Mount Sinai’s clinical workflow. As part of the investigation, we evaluated and documented the challenges that Mount Sinai would face if we moved forward with a broad-scale implementation of speech recognition. One clear initial challenge was that we would need to implement a speech-enabled reporting tool that could integrate with the RIS/PACS we relied on across our large, academic radiology department. As part of our mapped-out implementation strategy, we decided to seek 100% speech recognition adoption out of the gate across our team of more than 75 radiologists. We reasoned that only full adoption would achieve high levels of cost savings and productivity gains, so we aimed for 100% self-editing. While not all practices will wish to pursue this, we believe it offers the greatest cost savings and the greatest improvement in TATs. After analyzing the speech recognition technology that was available for the diagnostic market and hearing various success stories regarding productivity gains and cost savings achieved, our radiology department decided a pilot would be the best way to acquaint ourselves with and test speech recognition technology. In the spring of 2007, we rolled out a three-month pilot program involving seven radiologists. We chose early adopters so that fear of technology wouldn’t be a driving factor. As part of the test-bed workflow, we integrated a speech recognition reporting platform (RadWhere from Nuance Healthcare) with our PACS and RIS (GE Centricity). Our intent was to evaluate the integration between the products, as well as monitor the radiologists’ experience with the new speech-enabled workflow. Initial efforts were directed at establishing connectivity and interfaces, sharing patient context, and establishing the minimum hardware platform that would allow all the necessary applications to perform well. We then proceeded to focus on the radiologists’ experience and workflow. The feedback that came out of the three-month pilot was uniformly positive. The participating radiologists found comfort with the RIS/PACS integration and were able to drive reporting productivity through speech-driven workflows. Following the pilot, Mount Sinai deployed the radiology reporting solution integrated with its GE Centricity PACS and RIS to enhance the complete documentation of radiology interpretations. The implementation involved a multisite rollout, initially at the Manhattan campus and subsequently across town at Mount Sinai Queens. The initial deployment at the Manhattan campus, which was completed within 30 days, resulted in 90% of the departmental users fully transitioning to the speech-driven workflow. Within 90 days of the project launch, we saw 99% adoption of the speech workflow. One radiologist, despite excellent use of the system, was resistant to change. As we had an obligation to maintain three on-site transcriptionists for one year until they were placed in other roles in our hospital, he was permitted to send his dictations for transcriptionist editing for that period of time. At the end of that year, he successfully joined his peers in editing his reports generated by the speech recognition system. Our Queens site was added during the following year. It uses the same RIS and PACS system as the Manhattan campus but employs different admission/discharge/transfer and medical record number systems. Despite these differences, the radiologists there successfully use the same reporting solution. Quick acceptance by our radiologists was facilitated by unanticipated positive feedback from our referring clinicians. Within days, they were coming to our department and congratulating us on our almost immediate TAT. Reports were waiting for the referring clinicians in their offices when they arrived from hospital rounds. In the emergency department, not only were the images quickly available to them in PACS, but now the reports were available as well. By generating patient reports in a timely manner, we are able to help referring physicians more quickly diagnose and treat patients. In an era where safely diminishing length of stay is an important goal, faster report delivery is a significant benefit. With radiologists both creating and editing their own reports, the need for medical transcription support was eliminated, and money that would have been spent on transcription was saved. Mount Sinai attained return on investment four months after deployment. Beyond reporting, our team began to utilize additional aspects of the speech recognition solution. When physicians dictate reports, they have the ability to digitally sign it in one session. In our facilities, that change eliminated the end-of-the-day rush for the radiologist and reduced the time between exam completion and when a report becomes available to the referring physician. On average, report TAT decreased from 72 hours to less than 24 hours. Our pilot quickly rolled into a full implementation. This success has motivated our diagnostics team to dig deeper into how we can further improve the reporting process. We are currently exploring “autostructured” reporting to ensure that certain date elements of the report are consistently present. We are working to find the right balance of structure vs. free text, which we hope will ultimately enable Mount Sinai to use radiology reports for better downstream decision support and implement new quality initiatives. Data mining a structured report is easier than data mining free text. Based on the autostructured reports, we expect to start two initiatives: monitor the reports for quality metrics and use keywords and EMRs to trigger different workflows downstream. With improved multisite workflow for radiology reporting, Mount Sinai fosters increased productivity for both the radiologist and the referring physician and also improves patient care. Keys to our success were dedication to technology research, evaluation of integration capabilities, an understanding of the organization’s workflow needs, and an internal support team to pilot, train, and deploy the system. — David S. Mendelson, MD, is chief of clinical informatics and director of radiology information systems at Mount Sinai Medical Center in New York.